The Beatles can be traced back to the Quarrymen, a group formed by John Lennon and five other musicians in the mid-1950's. Paul McCartney joined the group in 1957 after he and John Lennon met at a church function. George Harrison joined the band shortly thereafter. The three, plus bass guitarist Stu Sutcliffe and original drummer Pete Best played under several names before settling on the Beatles in 1960. Pete Best was replaced by a drummer named Ringo Starr in 1962. That same year, Brian Epstein, a Liverpool record store owner who had become their manager in 1961, secured a record contract for the group. The Beatles gained nationwide fame in 1962 when "Love Me Do" climbed to No. 17 on the British charts. Their second single, "Please, Please Me," was their first number one hit. In 1964, the Beatles became a global force in music. They toured the U.S. creating a sensation everywhere they performed. The era of the Beatles had begun! They starred in two popular movies, A Hard Day's Night (1964) and Help! (1965). Another world tour took them to Australia, the Far East, and back to America. Eventually hysterical fans made live performances impossible. The Beatles performed their last live concert in Candlestick Park, San Francisco on the 29th of August 1966. During the middle and late 60's the Beatles helped to give rock music a new direction. Earlier rock music had been based primarily on a strong beat, but the Beatles' music contained a new sense of melody. Their chord progressions were also more complex, and the lyrics of their songs were more imaginative and meaningful. 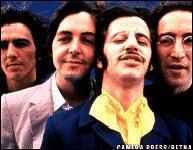 The Beatles began to drift apart in the late 1960's for a number of artistic, business, and personal reasons. The group broke up in 1970, but by that time their records had outsold those of any other popular music or rock music performers in history. Sadly on December 8, 1980, John Lennon was murdered in New York by a crazed fan, Mark David Chapman, putting an end to the hopes of millions of fans that The Beatles might reunite. On the 29th of November, 2001, George Harrison died in Los Angeles, due to complications connected with throat cancer. Today, The Beatles are an enduring legend. Their music will be remembered and loved for many generations to come.